The Goonies, one of the most celebrated family films ever, will be screened for the very first time in Europe across a trio of UK dates. A childhood favourite for several generations, The Goonies was released in 1985 to both critical and commercial success, and to this day it remains a cult classic. Directed by Richard Donner, the film’s screenplay was written by Chris Columbus from a story by executive producer Stephen Spielberg. It focuses on a group of kids from "Goon Docks", a neighbourhood in Oregon. Upon attempting to save their homes from demolition, they uncover a centuries old treasure map, leading them through a perilous chase with a criminal family who are also seeking the treasure. 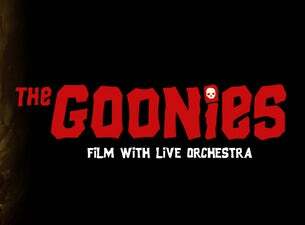 Composed by Dave Grusin, an Academy Award and 10-time Grammy winner, the score to The Goonies is as daring as its young protagonists, introducing electronic elements as well as orchestral. It heightens the drama right from the memorable opening scene’s wonderfully bouncy "Fratelli Chase". Come hear its classic score be performed live to picture by a full orchestra.